Home English Is this your anguish or wish Pawan Kalyan? Is this your anguish or wish Pawan Kalyan? 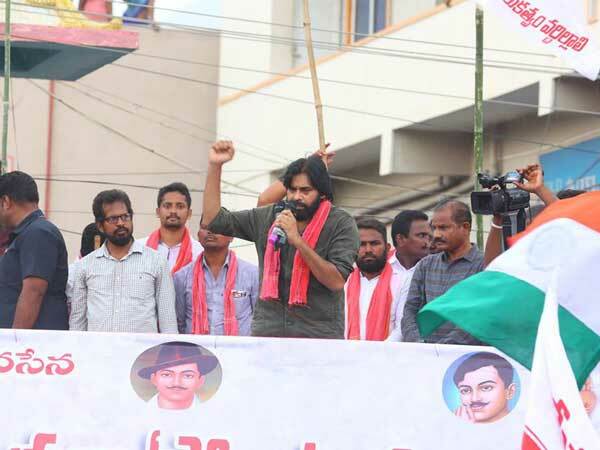 Pawan Kalyan resumed his Porata Yatra in Vijayanagaram district. Addressing rally of public at Srungavarapu Kota, Jana Sena chief slammed AP CM Chandrababu Naidu led TDP government for ignoring the plight of Uttarandhra public. He questioned why AP government is not concerned about severe water problem in Uttarandhra. “TDP rulers are keen on Polavaram and Pattiseema projects but are least bothered about Uttarandhra water woes. Instead of paying pension to unemployed youth, government should concentrate on providing employment to the youth,” said Pawan. The actor turned politician is being criticized for his inflammatory remarks igniting regional feeling among Uttarandhra public. TDP leaders allege that Pawan is conspiring to rake Telangana like movement in Uttarandhra to break the state just to fulfill his dream of becoming a CM. It is not his anguish for the public of Uttarandhra but his wish to become CM that he’s making false allegations on ruling party, opine TDP folks.